This article is about the collectible figurines from Super Smash Bros. series. For the collectible rewards from the Mario franchise, see Trophy. Trophies are collectibles found throughout the Super Smash Bros. series. 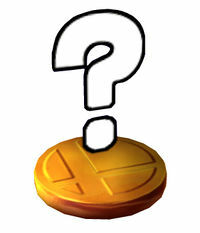 In the Super Smash Bros. series, trophies based around various Nintendo properties (including the series itself) appear. First appearing in Super Smash Bros. Melee, trophies are collectible figures the player can find in the aforementioned game, Super Smash Bros. Brawl, and Super Smash Bros. for Nintendo 3DS / Wii U. 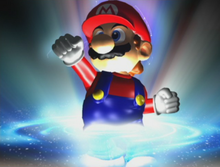 In Melee, trophies were introduced to replace the doll concept of the first Super Smash Bros., and have appeared in every subsequent game since. According to the story of The Subspace Emissary, the characters in this world are all trophies created and brought to life by Master Hand, and exist for no reason other than fighting. Whenever the characters are defeated in battle, they are forcibly reverted to trophies. Also, interestingly, trophies of the smashers in the Subspace Emissary are gray, shiny, full-size statues instead of the smaller trophies or statuettes seen in the Trophy Gallery. There are many ways to collect trophies in the Super Smash Bros. series. Common trophies can be collected by finding them in some Adventure mode stages or Smash Run, by getting them in a Classic mode bonus stage, by getting them in a lottery in Melee, by playing Coin Launcher in Brawl, and by playing Trophy Rush and Target Blast and buying them in the Trophy Shop in 3DS / Wii U. Some trophies can only be unlocked by completing certain event missions. To unlock trophies of the fighters (except for the alternative trophies in Wii U, which are common trophies), players must complete Classic, Adventure, or All-Star mode. Once a trophy is collected, it can be viewed in either the Trophy Gallery, where players can closely observe a trophy and read a description of it, or the Trophy Hoard, where all of the trophies the player has collected will be displayed together. In addition, in Brawl and Wii U, players can take photos of their trophies with the Photo Booth feature. There are a total of 293 trophies in Super Smash Bros. Melee. However, there are three trophies that the player can only get through an Action Replay device in the American version, while they are completely removed in the PAL version. There are a total of 544 trophies in Super Smash Bros. Brawl. Trophies return in the fourth installments of the series, Super Smash Bros. for Nintendo 3DS and Super Smash Bros. for Wii U. Like the stages in both games, trophies in the Nintendo 3DS version are mostly from handheld games, while trophies in the Wii U version are mostly from home console games. It was mentioned that even the Nintendo 3DS version alone contains more trophies than Super Smash Bros. Brawl did. There is a "Trophy Shop", where trophies can be purchased by either coins from battles or Play Coins. Some of these trophies can also occasionally be purchased at a discount. Including DLC, the 3DS version has a total of 707 trophies, while the Wii U version has 743. The descriptions of the trophies, unlike in Melee and Brawl, are written in a more jest and tongue-in-cheek manner. This page was last edited on November 25, 2018, at 06:06.